No cook, however practised or amateur can do without kitchen scales. Bakers know it, dieters know it, everyone who’s tried their hand at a recipe with more than two steps is sure to know it: measuring and weighing is a fact of life in the kitchen. Our list of the best kitchen scales includes both digital and mechanical, and will take the guesswork out of your gâteaux, the confusion out of your cakes, and the trouble out of your tarts. But first, you need to know what to look for. Features to look out for when buying kitchen scales? The inclusion of an add-and-weigh function means that you can tare, or zero the scales, with weight already in the bowl, which is perfect for bakes with a long list of ingredients and prevents the need for multiple trips to the mixing bowl (or the washing up bowl). If you typically weigh a combination of wet and dry ingredients — or you want to save on space or dosh by cutting out the need for a separate jug — the best set of scales for you will do both, so look for a list of weighable units that includes fluid ounces or millilitres. Even better, go for a combo scale and jug set-up with inbuilt handle for maximum efficiency. Other than that, your main choice is this: digital or mechanical scales? Digital scales with an LCD display eliminate the risk of human error and are especially helpful if you happen to misplace your glasses (no judgments here), plus they are usually accurate to .5 of a gram. Mechanical scales utilise springs and a dial display, which can be just as precise, but difficult to determine the exact amount by eye. For retro factor, though, they can’t be beaten. By the way, it's a great time of year to be buying your kitchen appliances; before you commit, make sure you check out our best Black Friday appliance deals. Yet another triumph of design engineering from kitchenware geniuses Joseph Joseph, the TriScale is an inspired little product that saves on space in shared or small kitchens. A strange-looking three-armed contraption, it folds down to bottle-opener size for easy storage in the drawer when not in use. The add-and-weigh function is also particularly convenient, allowing multiple ingredients to be weighed in the same bowl — also, anything that cuts down on washing up gets an immediate yes from us. Bluetooth-enabled kitchen scales might seem like a bizarre indulgence, but really, they’re rather clever. Cooks who already keep their mobile device close at hand to double-check amounts or instructions will find the process refined with Drop’s buddy app which is full of scaleable recipes designed specifically for the unit. 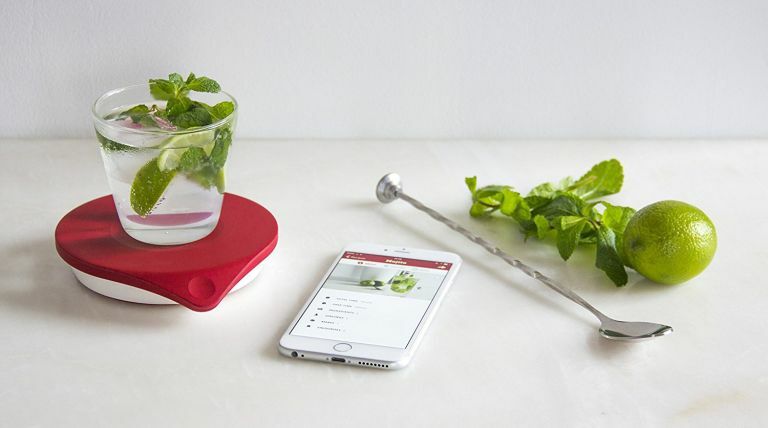 The touch button on the front of the scale allows you to interact without getting floury mitts all over your beloved tablet, while the rest of the scale is covered in heat-resistant silicone for a durable, easy-clean (but attractive) finish. This nifty little appliance saves on space and pocket money in one fell swoop, offering a digital kitchen scale and jug in one compact, good-looking package. You can tare with ingredients already in, maximising efficiency and minimising washing up — did we mention the stainless steel bowl is dishwasher-friendly? — and the LCD screen ensures you stay accurate while doing so. Finally, choose from four colourways to match your dining decor — whichever one you go for, you’ll be in for a treat. These digital weighing scales from time-honoured and trusted brand Salter might look simple, but they conceal a number of charms. The flush stainless steel platform is hygienic and easy to clean for weighing without a vessel, and the add-and-weigh function means you can tare with multiple ingredients already in. Measuring both wet and dry ingredients in imperial or metric, it’s also accurate up to 5kg. Plus, it comes in at under £20. There are lots of things that electronic scales do very well, as their presence on this list can attest — but sometimes only old-fashioned weighing scales will do. That’s where these snazzy Colourworks mechanical scales come in, bringing a pop of colour and old-school charm to your kitchen worktop. The easy-to-read dial shows both metric and imperial units, and the stainless steel bowl adds a modern touch, without absorbing odours or flavours from robust ingredients. Our only complaint: It doesn't weigh liquids. As much an art piece as a viable option for everyday weighing, this set of old-fashioned traditional scales is beautiful and useful in equal measure. Forged from indestructible cast iron and featuring an acacia wood stand, it’s certainly built to last. With thoroughly modern touches too such as a tear-shaped weighing dish which is handy for scooping and pouring ingredients, and is also stainless steel rather than the traditional brass, for durability and ease of cleaning. It’s also surprisingly easy to use with imperial or metric weights (sold separately), the only problem is that it won’t be as accurate for exacting cooks.